I never had the aptitude for a career in medicine. I once fainted on the playground when Craig LaChance got a bloody nose (though I can still make a fairly strong argument that the consumption of an expired Pop Tart was the culprit). As my friends would talk excitedly about becoming future doctors and surgeons, I dreamed of becoming an artist or a musician. I entered art school at the age of 18 fully expecting to change the world. Or start a band. Or start a band that would change the world. While I've since started many bands, we never quite changed the world... one drummer in particular couldn't even be trusted to change his underwear! Now as a Front-End Designer/Developer at Page One Web Solutions, I feel like I've finally become a surgeon (of sorts); a pixel surgeon. Whether we're working on a site for small industrial company or a large corporation, we root out a site's problem areas and prescribe the solution. In the era of cookie-cutter website providers such as Wix and SquareSpace, we make websites the old fashioned way; We beg, cry and plead with the client to let us make improvements that align with the most up-to-date web standards. These include things like removing the "home" button, making navigation intuitive and consolidating content so it's as concise and optimized as possible. We look at a company's needs like a doctor evaluates a new patient. We don't treat what isn't broken, but we also advise laying off the sweets (I'm looking at you Magento). Like any good doctor, we want to give our clients the tools they need to live a long and prosperous life. That's why we start each project with a site audit. Think of it as a full diagnostic to see what your site is doing well, and where there's room for improvement. We evaluate everything from branding (is your logo outdated?) to site speed (is it taking too long for your visitors to find what they're looking for?) and then we report our findings. "Doctors make the worst patients." With over 60 clients nation-wide, there was always plenty of work to go around. The only problem with that was that we couldn't find the time to work on our OWN site. New Google standards were giving preference to sites that were fully responsive (meaning a site must be optimized for viewing on mobile, tablet and desktop). Though we've become evangelists for responsive design and have launched over 20 responsive websites in the last year, our own site wasn't mobile-friendly. We realized it was time to practice what we preached. We approached the creation of our own site exactly like that of a prospective client; with a full diagnosis. Our internal site audit revealed that while our blog posts are informative and timely, we weren't fully utilizing social media to expand their reach. The design was outdated and the portfolio section was both hard to find and not representative of our best work. Our sitemap had become convoluted and confusing as content had been added with very little editing to remove sections that were no longer relevant. In short, we found ourselves guilty of the very things we admonished in our clients' sites. Now that we knew what was wrong, it was time to get to work. From the very beginning the new site was a collaborative venture. Sully and Pat had a very clear vision of what they wanted from the new site. Pat viewed the site as a potential sales tool, while Sully wanted a site that clearly demonstrated the latest web standards. I quickly mocked up a design that I felt met both ends. The new design would utilize large, full-width images and a scrolling homepage that allowed access to many sections of the site with just one click. We knew we wanted the ease-of-use afforded by WordPress so we started with the responsive Bootstrap framework. Scott and I teamed up to ensure the coding was as efficient as possible. All the while, Jenika led the Marketing team in the writing and curating of the new content. Becky and Emmie wrote countless drafts which were then plucked, pruned and massaged into our finished copy. Lauren and Corey acted as Quality Control; viewing the site from a user experience perspective to make sure the site was intuitive and easy to use. It was truly all hands on deck as we discovered that with enough coffee anything is possible. In the end, we had designed, coded and launched a site in just under two weeks! Everyone's efforts combined into the creation of a site that accomplished all of the goals we had set forth at the onset. 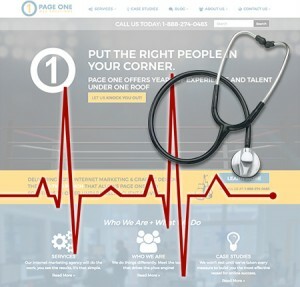 The new site was easy to navigate, clearly conveyed our skills and capabilities and featured a revised Who We Are section that celebrates what makes Page One different than other internet marketing and web design firms – its people. Like a team of specialists, we had diagnosed, operated and repaired the issues that were keeping us from putting our best foot forward to the public. We'll continue to monitor our vitals and make adjustments as needed, but from the response the site has already garnered – it's clear that at Page One, the doctor is IN.